Ain't It Funny How Time (3.5 billion years worth) Slips Away? over the last billion years of evolutionary time. A 12.5k hike where each average stride = 60,000 years. I met a long lost cousin yesterday. Or rather, a long line of them. In fact, an incredibly long line of cousins stretching back a billion years or so. One of them was from the Comb Jellies era, which you may associate with greasy Brylcreem products from the 1950s and the line "Kookie, Kookie, Lend me Your Comb." Am I dating myself yet? If so, that's actually a good thing, because "Comb Jellies" are life forms properly titled Ctenophara that live in marine waters all over the world. They have combs used for swimming, making them the largest animals that swim using cilia, tiny comblike projections. Ctenophara date from about 730 million or so years ago. They're one of many of our ancestors who are still hanging around (or should it be hanging on?) on earth. 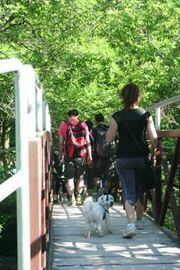 Just after 8 a.m. Sunday, a group of some 50 people gathered at Erindale Park to take part in the fourth annual Ancestor's Trek, the evolutionary annual hike organized by Mississauga veterinarian Dr. Kevin Saldanha who is a mainstay of the Halton-Peel Humanist Community. He's borrowed the thematic bent of a book called The Ancestor's Tale and translated it into a local annual trek that combines several agreeable elements including walking, heritage, science and education. While lifeforms have been around for 3.5 billion of earth's 4.5 billion years, the party didn't actually start with Paris Hilton. It started when cells decided to get together and then divide, one of those far-sighted early breakup and recombination reality concepts that always get such good ratings. 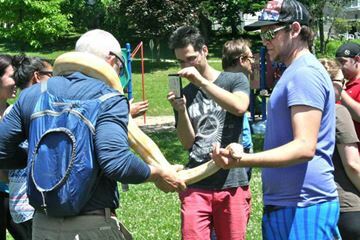 "We do have a kinship with many other things and we will be following the path that humans took," explained the long-time Mississauga resident as the event kicked off in bright sunshine. "Each stride you take represents about 60,000 years. "The time that humans have been on earth in the form we have today" (~200,000y) would be taken up in the last 3 strides that each walker took yesterday at the end of the hike in Pinecliff Park, he explained. Talk about readjusting your scale of measurement. If that fact alone doesn't do it, how about all recorded history (about 5000 years) would fit into 6 cm (a palm width) or our entire modern world (constructed during the last 300 years since the industrial revolution) would be about 1.5cm of that (a mere thumbs width). The walk stretched 12.5 km from Erindale Park along the Culham Trail that winds beside the Credit River, all the way up to Pinecliff Park in Meadowvale South, just south of Kenninghall Blvd. At various information signposts along the way, Saldanha reintroduced us to our cousins the Choanoflagellates (there's one who overdoes it in every family), the sponges, the placozoans (literally "flat animals") and eventually to the jellyfish, dinosaurs and the monkeys. In other words, the regulars who always show up at the annual reunion. Periodically, Saldanha would wax philosophic on the potential end of the story, noting for instance that the last of the five "extinction" events in earth's history killed the dinosaurs and wiped out all the other mammals on earth, with the exception of one burrowing mole species, from which we (and all other mammals from mice to whales) are all descended. And we are now contributing to the 6th great extinction judging from the number of species going extinct due to pollution, deforestation and climate change. Another of our common ancestors, coral which counteracts ocean acidification and provides critical habitat for fish to spawn, is in major, major difficulty due to ocean warming and elevated carbon dioxide levels, he explained. Commercial fishing for shrimp and prawns is doing major damage to coral reefs. "It's like losing the rainforest of the sea," Saldanha said. "This is not just about our common ancestry. It also teaches us a little bit about how we, as humans, are changing the environment. "That's not to say that everyone has to go vegan," he added. "But just be a little bit more aware of what we're doing when you go to Red Lobster." 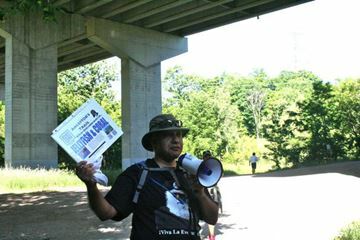 At that point, standing underneath the Highway 403 bridge Saldanha reminded walkers that they could still get their Ancestor's Trail "passports" marked for various prehistoric checkpoints. "Don't worry if you don't get them marked, you'll still get a hot dog at the end," he added. "With no shrimp," some wit pointed out. 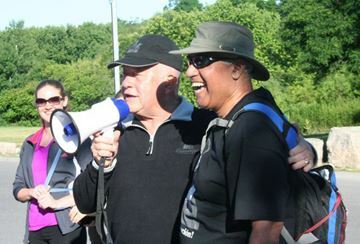 The presence of former Ward 6 Councillor David Culham, for whom the trail was named, made it a historical, environmental and political education as well as a scientific one. He recalled the days when much of Erindale Park was actually Erindale Lake, part of a hydro-electric plant whose remnants can still be seen in some areas. It's unlikely many of its users also know the park, like so many others including Port Credit Memorial, was originally a garbage dump. As the trail wended its way through Hewick Meadows, Culham recalled the late night call he received many years ago from local planning consultant John Rogers which triggered his even more late-night negotiations with Steve Hewick, which resulted in a negotiated deal in which the land below the top of bank was donated to the city. Culham thinks the clincher to the deal was his appeal to Hewick that other children should be able to learn to kayak on the stretch of river the same way that his children did. The former Ontario Municipal Board member was also able to fill in the historical reason for the gap in the trail in Streetsville. While ADM Milling on Barbertown Rd. has granted an easement through its lands, hard feelings between Kraft Milling and the residents — hard feelings that ended with a messy Ontario Municipal Board hearing — still haven't healed. But Culham remains optimistic about eventually getting access along the valley right through Streetsville and north of Highway 401 in Meadowvale Village where negotiations have been going on for years. 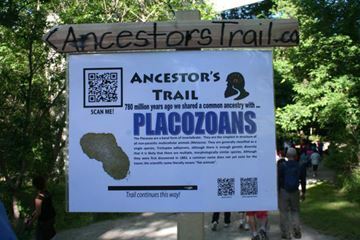 As participants reached the end of Ancestor's Trail, they got an up close and personal chance to communicate with their reptile relatives, including an albino Burmese python, Argentinian black and white tegu and frilled dragon iguana, which were brought to the site by local reptile enthusiasts. And, as promised, there were hot dogs. With nary a shrimp in site. 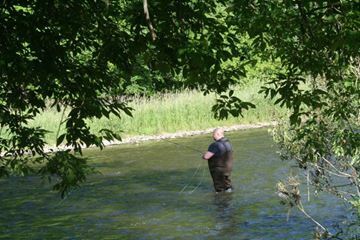 An angler tries in luck in the middle of the Credit. The crowd included about 50, not counting pets. 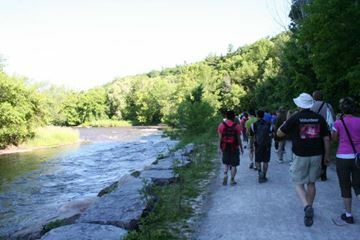 The event travels the Culham trail, on the east side of the Credit River. Markers along the way detailed the life forms that preceded human beings. Dr. Kevin Saldanha started Ancestor's Trail four years ago and continues to lead the way. Here he explains the importance of sponges at a stop below Highway 403. 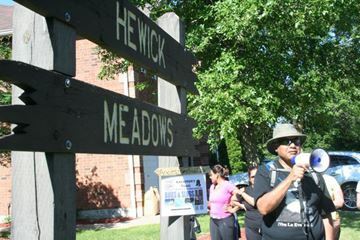 A stop at Hewick's Meadow, just south of Eglinton Ave. W.
This stop behind River Grove Community Centre, detailed one of five extinction events in the earth's history. There's always time to stop and take a photo of the scenic Credit. 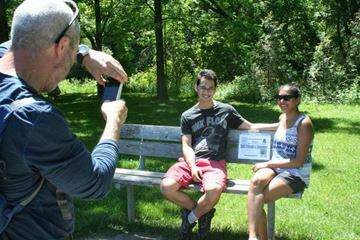 A commemorative photo at Pinecliffe Park marks the end of Ancestor's trail, for this year. 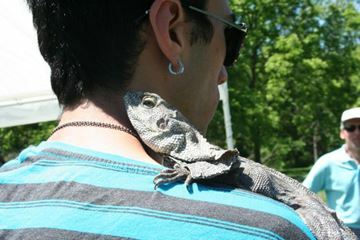 A frilled dragon iguana, on display t the end of the hike, enjoyed a sunbath on his owner's shoulder. 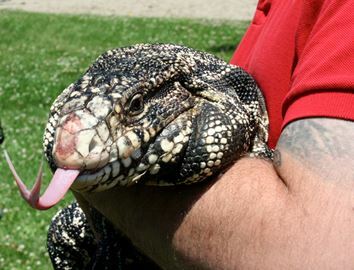 An Argentinian black and white tegu spoke with forked tongue, and got lots of attention. 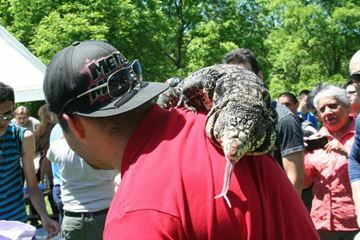 This Argentinian black and white tegu was a big hit at the end of the Ancestors' Trail 12.5 km. 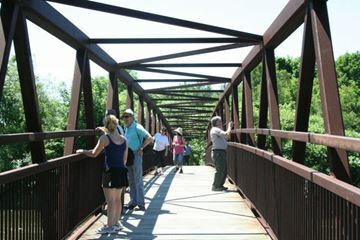 walk along the Credit River Valley Sunday. 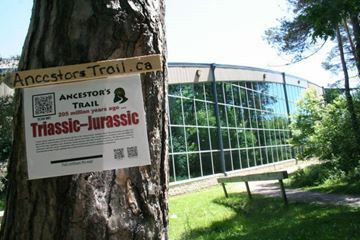 The trail included a series of stops that highlighted the forerunners of humans, including reptiles. Photo by John Stewart.